You’ve just received a sought-after invite to an exclusive event. And then you scroll down to find those two dreaded words: dress code. With so many clothing options out there for women, it can be confusing as to what exactly that means. Are you expected to wear heels? Will your trusty little black dress fit the bill? 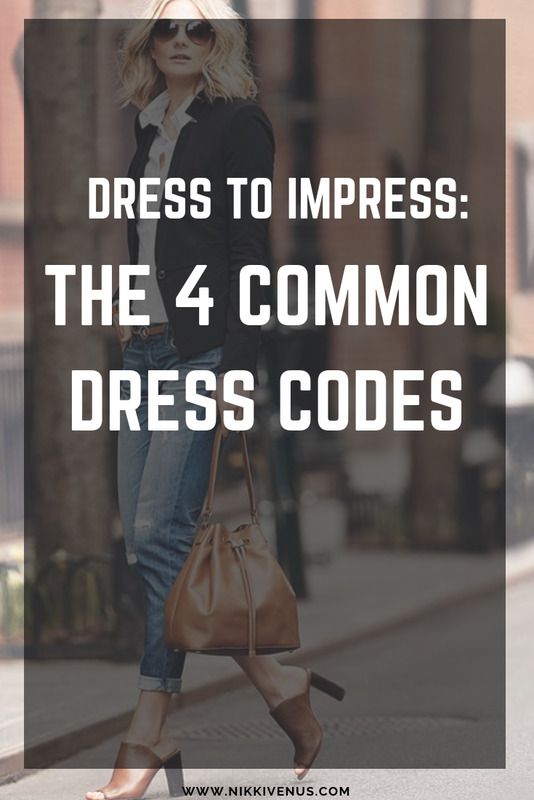 To answer these and more of your burning dress code dilemmas, I’ve rounded up your go-to guide on the four most common dress codes. For women especially, this implies a polished and fairly conservative ensemble. Go for dresses and skirts that fall either on or just below the knee. Other more modern additions include a pair of tailored dress pants matched with a blouse and blazer. One way to add some of your own personality is through beautiful feminine fabrics like silk or chiffon in your choice of blouse. Do steer clear of anything revealing or risqué however. If in doubt, cover up with a fitted blazer. This is where things get a little trickier. Business casual started out as a way for office workers to get a break from their stiff suits and pencil skirts. Today though, the lines have become more blurred. Every company has its own culture but think of business casual as your formal workwear with an informal touch. A shift dress worn with a fitted blazer and wedge heels, for example? The basic premise is that you appear neat and put together yet more relaxed and approachable than traditional office wear. More and more companies are opting for a smart casual dress code these days, particularly those in the creative and tech sectors. And it makes sense too. Smart casual means we get to wear our typical weekend casual favorites only with a more structured, dressy touch. Think your beloved denim jeans matched with a pair of statement heels. Remember to keep it all color-coded and streamlined for an elegant appearance. It’s true that everyone’s opinion of casual is subjective. One benefit of a casual dress code is that you’ve got the choice of adding in more current fashion trends to your look. A fitted leather jacket over your floral sundress perhaps? Or maybe you have a thing for interesting textures like velvet or bolder prints and patterns? If you’re ever in doubt, a good rule of thumb is to stick to neutral shades like black or navy blue. The overall effect will be modern and urban while still sleek and polished. Dress code sorted!